Like seismic pressure that may-or-may-not indicate a volcanic eruption, the evidence keeps mounting that we may be seeing the incredibly long-awaited StarCraft II beta test sooner rather than later. First, there was the clip of the developers celebrating the beta, and now? We have the hardware requirements. The final requirements for StarCraft II have not yet been determined; due to ongoing development the minimum requirements listed above are subject to change at any time. Though it says they may not be the final requirements for SC2 when it releases, it's a good bet that Blizzard will end up with something similar (at the very least) for the real deal. As with all Blizzard games, the requirements seem pretty goddamn reasonable, so older machines will be able to run it (just not in its fullest glory). 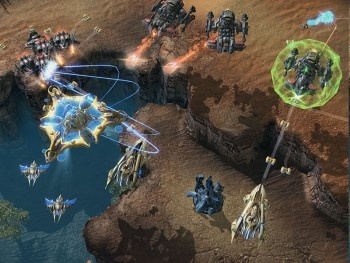 At last report, there will be no beta client for the Mac - but the actual release of StarCraft II will contain both PC and Mac versions of the game on a single disc, like very other Blizzard game since Warcraft III. This could be Blizzard ramping up for the true home stretch at last, or it could be a false alarm like so many others. Let's keep our fingers crossed, folks. Update: Sadly, this goes under the "false alarm" for now - Blizzard let Kotaku know that these specs were not the real deal, and that they appeared on the company's support site mistakenly.